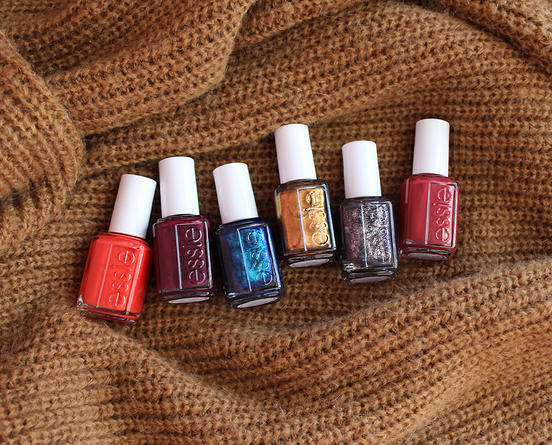 Alright, I know it’s still early August but I am DYING over this gorgeous essie Fall collection! (Pictured left to right: ‘color binge’, ‘in the lobby’, ‘bell bottom blues’, ‘leggy legend’, ‘frock n roll’, and ‘with the band’). If you didn’t already know I’m utterly obsessed with everything Fall related. What’s not to love about crisp mornings, hot drinks to keep you warm, sweater weather, Halloween and Thanksgiving?! Not to mention new trends for clothing and beauty! “Lights? Check. Sound? Check. Inspiring colour? You’re on! Taking centre stage this season is iconic rock ‘n’ roll royalty: the queen of the entourage, the unstoppable, impossibly stylish muse. Darling of the 1970’s music scene, everyone on the a-list wants her or wants to be her. She turns up at every gig, fashionably late and perfectly turned-out. How does she do it? Or, how doesn’t she do it? In a fitted suede trench and custom bell-bottom blues, she’s the perfectly stylish match for rock star paramours like Mick Jagger and Eric Clapton and fashionable friend to sirens like Joni Mitchell and Janis Joplin. Backstage. On tour. The endless parties. The hotel hotspots. The tabloid gossip. Rule number one: If you want to be a muse: dress for success. It’s easy to turn style into a career-catapulting platform, if you are a leggy legend. Mix major attitude and rebellious spirit with a peasant blouse and knee-high boots, finish with a fiercely alluring manicure and you’re good to go. L to R: ‘leggy legend’, ‘color binge’, ‘with the band’, ‘in the lobby’, ‘bell bottom blues’, ‘frock n roll’ 2 thin coats of polish topped with essie gel•setter top coat. Here’s how they look once applied. 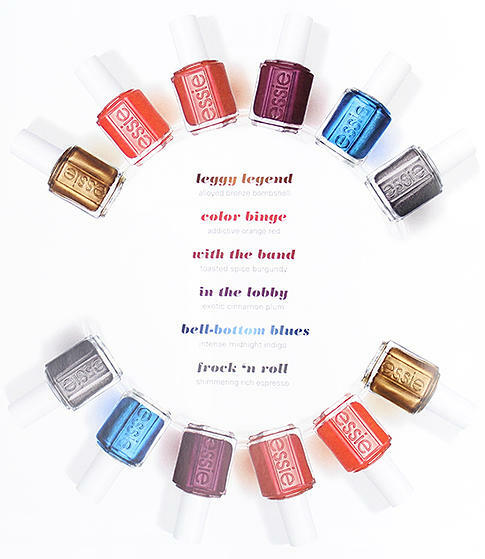 I’m loving ‘leggy legend’, ‘bell bottom blues’ and ‘frock n roll’ !! The added shimmer just gives an extra almost holographic touch, which is pretty rare for essie. All of these colours are on point for Fall, and I can see myself wearing these throughout Fall AND Winter. Which shades will you be picking up? 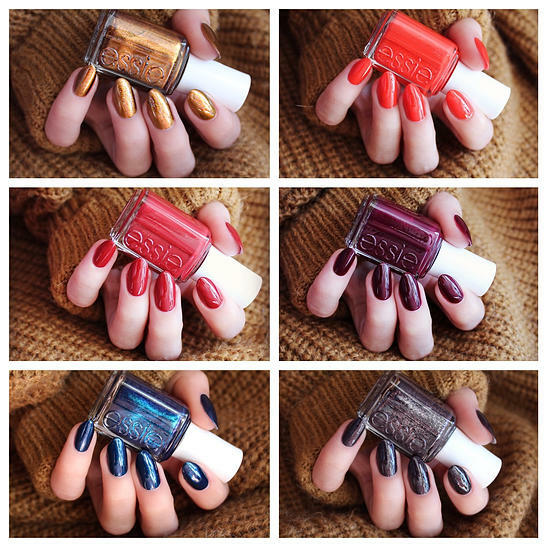 The essie Fall 2015 collection will be available in Canada starting August 25.